I ordered a set of 4 washers/spacers along with the pulley and the wiring kit. I am not a numbers correct type of person. I want the car to be what I want. 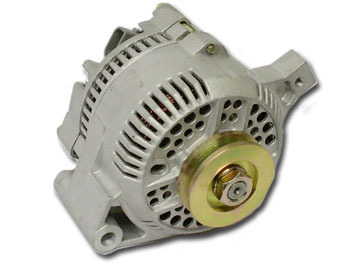 As far as the alternator itself, it had better be the 130 amp style, but I need to research and see how to id it. If not I am going to be a bit unhappy with myself for not making sure when Ibought it. This is my first foray into the 3G world. Here is a pivot mount small case(note the number of holes in the 3 "spokes", this gives you a quick reference of what case you are looking at), note the 4 holes, the large case has 2 holes per spoke. Just went and checked mine out. It is a 2 hole. Supposed to be from a 92 Mustang with a 5.0l, at least that is what it is marked as. The guy I bought the wiring harness and pulley from also has rebuild kits for around $25. Although I am not having any luck finding one that states it is for the 92 Mustang. I have sent him a question thru Ebay just now.